Kickboxing is a form of martial art that combines elements of karate with – yes, you guessed it, boxing! Ideal for men and women as a high energy workout, it’s performed without shoes (far safer!) and using pads and punch bags. A high intensity cardio workout, kickboxing will raise your heart rate, and as a strength exercise you’ll find you tone your upper and lower body as you punch and kick. Increased Flexibility: It may take a while, but gradually you’ll be able to kick higher and higher. Great for joint flexibility you’ll be able to kick above your head in no time! Boosted Circulation: Any cardio exercise gets your heart rate going, and kickboxing is no different. The fast movements and changes in direction will increase your circulation. 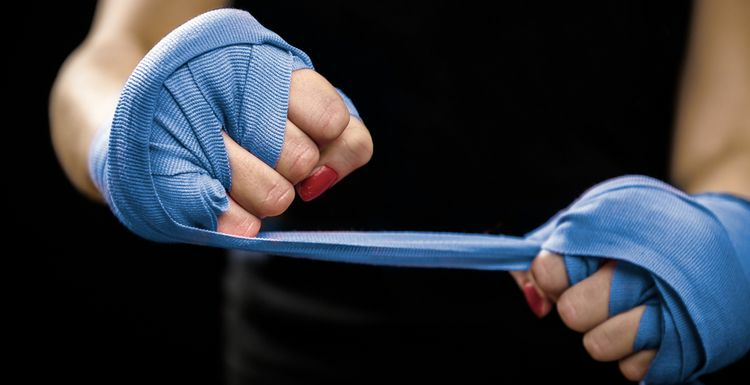 De-stress: There’s nothing quite like taking the day’s frustrations out on a punch bag! Hitting something very hard is a sure fire way to release any pent up anxiety and stress, meaning when you go home your aggressive mindset will be back to calm and collected! Combining strength and cardio: A kickboxing class is a great all-rounder, meaning the whole body gets conditioned. One exercise for all areas. Self defence: As well as boosting confidence, kickboxing is great for anyone who wants to feel confident in self defence. Fat burning: You’ll burn plenty of calories in a kickboxing session, as your heart rate rises and you use up your energy supplies. Better Balance: If you ever struggled to stand on one leg, kickboxing will soon sort that out. With practice you’ll soon be able to leap gracefully from one leg to the other. Inclusive: Kickboxing can be for everyone, it’s non-contact, so no one gets hurt, and everyone can enjoy punching the bags and getting fit! Kickboxing is a great martial art, but I would also recommend trying as many other ones as possible. You never know which one you will click with. I really enjoyed Muay Thai, which is similar to Kickboxing. It probably depends on the teacher, so find a good class, that's the key. I have recently tried this and really enjoyed it. And there is indeed nothing like it for stress busting. Take that! And that! I like kickboxing and I don't think you need to go to a specialised kickboxing gym to do it. Some of them make out they're better than ordinary gyms, but any kickboxing class will get you just as fit. I have done wrestling, Judo and kickboxing and I do do think that Judo works me harder and gets more results. Kickboxing is good for my partner though.